As our culture attaches itself more to social media, reputation, and how our lives appear through specifically designed photos and status updates, I find myself dwelling on the fact that we now live in a world where (whether it is reality or not) there is a way to craft and filter ourselves to appear to have strong sparkle. The faux sparkle filter (and the temptation to use it!) is real. My name is Mary and I am a Whole30 Certified Coach. I am also a wellness coach, a Reiki Master, a peer supporter, and a wellness consultant. Those are a few of the words that my bio and the Internet use to describe me. These words mean very little in expressing the defining experiences of my life. I am a human. Social media and my website will show you that I love talking about sparkle and digestion, have a passion for music, reading, meditation, nature, healing, tarot, and my perfect Boston Terrier. Between the lines of those images and references, and sometimes more directly, you may find more of my story, as I navigate getting comfortable with sharing my whole self. The whole story includes the unfiltered details. I have struggled with depression and anxiety for most of my life. I often prioritize other people’s needs over my own, and find value in myself if others want to be around me. I have terrible FOMO, which presents as anxiety, and evolves into a real pounding on my self-esteem. Sometimes, due to some trauma, I have awful nightmares. I have spent a lifetime seeking to numb my feelings, as my sensitive nature can overwhelm me. This numbing of feelings and dealing with trauma has also led itself to an array of self-harming behavior and habits over the years. When I was 19, I attempted to end my life, which resulted in my being hospitalized for both physical and mental health reasons. I navigated many years where I was overmedicated, followed by years of clearing the medication from my system, followed by a deep-dive into holistic and natural healing. I have spent thousands of hours (and even more dollars) in therapy to manage my human experience. Very little of this comes through on my Instagram feed, unless you read between the sparkles of the content I curate. Last year, I was named as a Whole30 Certified Coach. I am so proud of that title, and stand by the statement that the program absolutely changed my life. I have talked about that somewhat extensively, but it is important to me that you know that there is more to the story. Food is a complicated territory in my life; there is no denying. I have shared about my experience with disordered eating and my hard work to find food freedom, in which Whole30 has played a major role. But the truth in my reality is that over the past year, I have struggled with the learning curve that comes along with being a Whole30 Certified Coach. I am not talking about learning the rules and details of the program, those I know inside and out from my own experience. If a question stumps me, I can usually have an answer within moments, as I know where to find them 99% of the time. My struggle has come with the label of representing this aspect of wellness, finding where I fit, and navigating a new territory in the world of social media. More than anything else, the struggle has been within myself. Whole30 accepts any and all humans to go through the certification process. The requirements to become a coach are not complicated. The testing process is rigorous and the fee is a very small price to pay compared to a) other coaching certifications, and b) the amount of support, community, and food samples that just may show up at your door (nourishment comes in many forms!). Whole30 does not prescribe a specific “type” to represent Whole30. There are no weight or size requirements, nothing stating that coaches must workout or Whole30 24/7/365, and no expectations that coaches must be fancy food photographers. All of the pressures that I have stumbled through in my first year as a Whole30 Certified Coach have been due to my expectations, self-esteem, and the burdens that I have dreamed up and placed on myself. Whole30 is not about eating a specific way 100% of the time. The idea is that you learn, experiment, and design a food framework that makes you sparkle and feel good. Within moments of submitting my coaching exams, I was launching into my plan to complete another round of Whole30 (that turned into a Whole60), as I did not feel like I fit into my own expectation of what a Whole30 Certified Coach should be. To be clear, this came from me, not them. I was “SHOULD-ing” all over myself. Rather than celebrating the launch of a professional certification that I had long been dreaming could be a part of my resume some day, I immediately told myself a story that I needed to change. That is, quite literally, the opposite of what Whole30 represents. 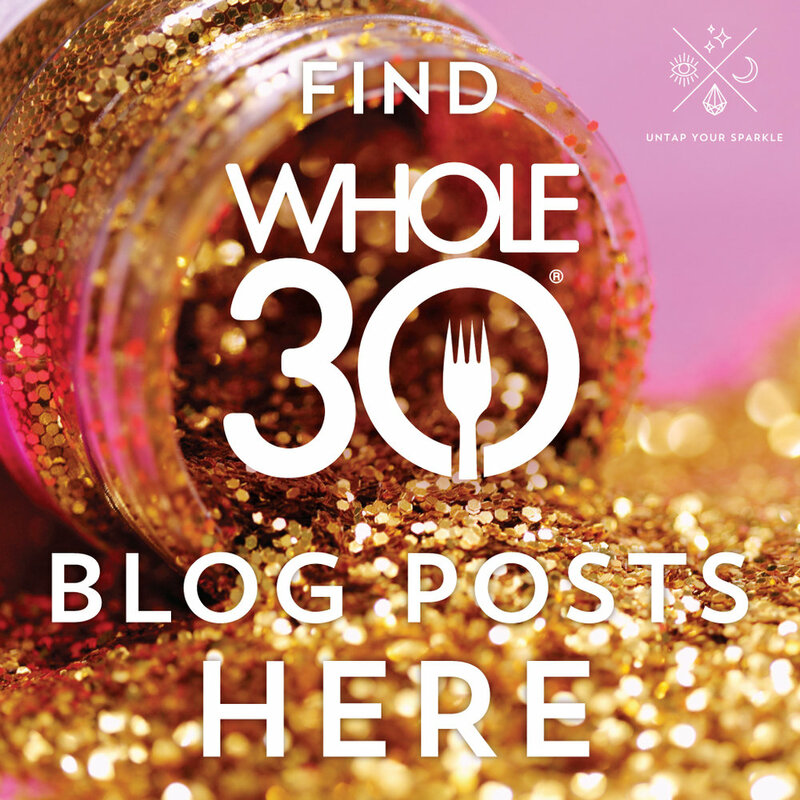 There are absolutely amazing, inspiring, badass coaches in the Whole30 family. I find a lot of joy and gratitude for the fact that I have a direct connection to these humans, and feel really lucky that I can learn from them. At the same time, it is really easy to get overwhelmed and compare yourself to influencers of this caliber. Over the past year, I realized just how new I am to the idea of “building an audience” (ugh), not to mention learning the ever-changing realm of social media. I have stumbled through the process of creating Instagram Stories, experienced the pull of “do this for the ‘gram”, and felt the surge of brain chemicals flow on the days when likes and followers showed up. All the while, my brain has been focused on staying sparkly in one breath followed by telling me that I will never be as good as other people on the internet in another. I have a lifetime of experience in battling negative self-talk and struggling with my self-esteem. I believe in showing up as my true, authentic self in every way possible, even on the Internet. Shifting sharing my experience into a more public landscape has proven to pack a punch. My feelings of “I am not enough” and the pressure I put on myself to be something or someone else would sneak up on me when I least expected it. The beauty of Whole30 is that the information is available to everyone. You can find the rules, recommendations, and many recipes (ahem, double check those ingredients ALWAYS) all over the Internet at no charge. You can buy fantastic books to guide you through the process as well, which is how I began my Whole30 journey. And, you can connect with any of the many Whole30 coaches that can provide support online or in your city. We all have different lives, interests, specialties, expertise, and experiences. If one Whole30 coach does not resonate with you, know that there are so many others available, wanting to support you. It was very easy for me to tell myself that I needed to be something I am not in order to succeed or be worthy of the title of Whole30 Coach. The truth of the matter is that connecting with a coach is not about having some perfect human hired to make you feel less than. Your Whole30 will be unique to you, no matter what. Connecting with a Whole30 coach is not about taking orders and struggling with comparison. Whole30 coaches are here to remind you that change is possible. We are your peers and we want to support you. We have completed at least a few rounds of Whole30, and likely have learned quite a bit from those experiences. We want to share what we have learned, and witness you in your learning. We are real, messy, complicated, beautiful humans. We have struggles. We have wins. We are often found experimenting and exploring and exercising our food freedom. Some days that process might be easier than other days. We are always learning. I am so proud to be a Whole30 Certified Coach. Walking alongside real, whole, complicated humans as they make change in their lives is my true honor. When we can see the beauty in one another’s journey, we can see the beauty in our own. I am Whole30. Whole30 makes me sparkle.